Joey loves things that fold: maps, beds, accordions, you name it. When a visiting mother of a classmate turns a plain piece of paper into a beautiful origami crane, his eyes pop. Maybe he can learn origami, too. It’s going to take practice — on his homework, the newspaper, the thirty-eight dollars in his mother’s purse . . . Enough! No more folding! But how can Joey become an origami master if he’s not allowed to practice? Is there anywhere that he can hone the skill that makes him happy — and maybe even make a new friend while he’s at it? Dori Kleber was an award-winning journalist and business writer before she began writing children's books. More-igami is her picture-book debut. She lives just outside Atlanta. G. Brian Karas has illustrated more than ninety children’s books, including two books about Ant and Honey Bee by Megan McDonald, Tap Tap Boom Boom by Elizabeth Bluemle, and the New York Times Best Illustrated Children’s Book Are You Going to Be Good? by Cari Best. G. Brian Karas lives in the Hudson Valley of New York. Kleber uses simple language but gives young readers great credit for understanding multiple concepts conveyed at once, and the story is all the better for it. Karas' soulful illustrations depict Joey with brown skin and cropped, textured hair, with other characters drawn to show other ethnicities. His art shows his hand, the textured pencil, and pastel strokes evident on the page, which gives the book a gentle, handmade feel. It's an excellent companion to Kleber's story, which encourages patience, practice, and sharing creativity, and finishes with a simple origami lesson for readers to try. A gem. Smart design decisions—including a square trim size, origami-patterned end pages, and subtle fold marks that divide Karas’s (A Poem in Your Pocket) images into vignettes—create a graceful visual underpinning to the theme, and an origami project is included for readers. It’s a quiet but effective reminder of the value of practice. Warm characters, gentle humor, and sweet illustrations convey the challenges of learning new skills without making them feel insurmountable. A title for all collections. Karas’ gouache-and-pencil illustrations clearly convey Joey’s fascination with folding, and the frustration he feels at not being able to practice. The cast is wonderfully multicultural: African American Joey learns about origami from a Japanese American parent, and is given a place to practice by a Mexican American restaurant owner. With engaging text, charming illustrations, and bonus instructions for an origami ladybug, this is a winner. Karas’s gouache and pencil illustrations show a cheery multicultural neighborhood and an entertaining array of origami attempts made out of many types of paper. Young readers can also share in Joey’s hobby if they try out the clear instructions at the end for making an origami ladybug. 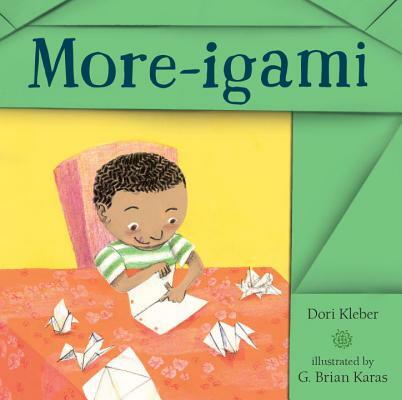 More-igami is Dori Kleber's picture-book debut, and she tells her story with both gentleness and wit, and plenty of playful repetition for storytime. G. Brian Karas (Muncha, Muncha, Muncha! ; Tap Tap Boom Boom) reflects her clean style with winsome, expressive gouche and pencil paintings. In a brilliant design coup, some of the pages have faint fold marks. Children who catch origami fever can fold their own ladybug using the step-by-step instructions in the back, and more and "more-igami" is sure to follow. Masterful.